We are two Filipino women who are passionate researchers and bloggers. We enjoy processing information and sharing them. One of us is still in college finishing her degree in Psychology while the other has long finished her engineering degree in the 1980s. hi ask ko po kung pano ko i-register ang mom ko. she’s 70 yrs old. at kung magkano babayaran monthly and ano ang magiging benefits niya dito? salamat! Hi Jim, download the Philhealth member registration form, print, fill up and have your mother sign it. Then go to Philhealth and register your mom. Bring her birth or baptismal certificate or senior citizen ID and her one-quarter payment of 450 pesos. Bring also her letter of authorization authorizing you to register her. Benefits? Philhealth will pay a portion of her bill if she gets hospitalized. Last january 14,2013 naka labas yung asawa ko nang hospital binayaran kuna yung e-excess nang Php 3,415.00 lahat nang na bili naming gamut at citicsan sa labasnang hospital binigay namin ang lahat nang official receipt sa incharge nang philhealth nang hospital hangan ngayun hindi pa natangap namin ang refund kaling na philippines, paano namin makukuha yung refund nami. Hi rose, yes, magagamit mo. Bayaran mo rin ang Apr to June 2014, para mabayaran mo ang 9 of the 12 months before month of delivery. Hi julie, Philhealth processing still takes 3 to 5 months or more. Wait for your notice from Philhealth, and if there’s no check enclosed, go to your clinic and ask for refund. Hi tanong ko lang po pregnant kasi ako employed ako from june to sept 2013 bayad po philhealth ko then nagresign ako tapos nakapagwork ulit ng november to march 2014 kaso january 2014 to march 2014 lang po ako naisama sa philhealth… Puwede ko pa po ba maavail ang philhealth maternity benefit if aug2014 ang due date ko? Hi aj, are you unemployed now? If yes, pay Apr 2014 to July 2014 as Individual Payor-Informal Sector, and you will be eligible. Can I used my philhealth for my father not yet 60, he is not a member and I how soon can I make him a dependent? hi good pm po pwede pa po ba mag apply ang mama ko shes 58 years old then pede nya na po ba magamit agad ang philhealth card nya paanu po ba? Hi maricel, yes, she can apply at the nearest Philhealth branch with her ID or birth cert. Minimum payment of 3 months = 600 pesos. She can use it after 3 months. If she likes to use immediately, she needs to pay 1 year (May 2014 to April 2015). Ask Philhealth too. I am an OFW. If magbabayad ako this month for one year ng premium ko and and delivery ko is on OCt. Can I avail the maternity benefits? Hi Kacey, yes, as OFW, your date of delivery should be within the validity dates in your premium receipt. Pay June to Nov or June to Dec.
Hi po, I’m an OFW and didn’t manage to continue my payments since 2008. Is it possible to refund all my previous premiums? I have my own medical insurance abroad thus continuing with my Philhealth premiums will just double my expenses, not to mention the complications of claims from overseas. Hi marie, no you cannot refund your premiums. If you paid 120 monthly premiums, you can be a Free Lifetime Member when you turn 60.
ask ko lng ilang beses ba pwedeng gamitin ang philhealth sa panganganak? Hi maryjane, coverage for normal delivery is only for the first 4 normal deliveries. I think Indicated CS coverage does not have a limit; ask others too. Hi vanessa, did you submit your Philhealth papers to the hospital? 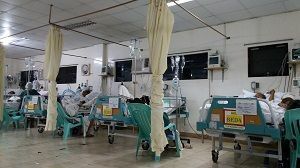 The hospital should have made Philhealth deductions in your bill. Hi diosdado, sad to say, Philhealth does not cover outpatient consultation. Hi michelle, payment of 3 of 6 months immediately prior to hospitalization is required. Ask Philhealth if the “advisory on paying 1 year in advance to qualify” is still valid. Hi Margie, the coverage for dengue 1 is 8k (5600 is for hospital costs and 2400 for PF) and dengue 2 is 16k (11200 for hospital costs; 4800 for PF). You pay for the balance. Usually doctors charge more for private room patients. Hi joselito, email an authorization letter to your family to verify your Philhealth no., update and process your Philhealth documents, including a scan or photo of your IDs and OEC or Philhealth receipt, so they can go to Philhealth with your birth certificate and your father’s senior citizen ID or birth certificate or any proof of age to transact with Philhealth and update and get your MDR. Hi rica, he can go to Philhealth with his ID and 600 pesos to pay for Oct to Dec 2014 (200 pesos per month). He brings your marriage certificate so he can register you as his dependent, and birth certificates if you have children. He’ll be given his MDR and his Philhealth card. You can register for him if he does not have time. He writes an authorization letter. Bring your ID too. If you’re near Robinsons Mall, check if there’s a Philhealth office there. good day, im giving birth next year march, so how much will i pay to avail of maternity benefit? Hi Cherry, yes, he can use it. He should pay on or before Nov 28 for the next 3 or 6 months so he’s prepared for future use. can i pay my contribution one year advance? Hi richelle, yes, you can pay in advance. hi nore, 6months pregnant now. If i register/enroll now for philhealth, can I use it for my delivery? why is there no reply to my question? Can I pay 1 yr in advance so I can use it if I get confined next month? Hi Charlene, you should pay for June July and August. But I don’t know if you’re still allowed to pay for June. If you like, you go to Philhealth with your ID. Hi annie, yes, he can be covered. What is not covered is if he is confined for the same illness within 90 days. Good evening po..for clarification lng..i was completely abortion/miscarriage,hindi po ako na confined sa hospital, ilang oras lng po ako na admit sa ER the time i was hypogastric pain wth bloody vaginal discharge.lumabas namn agad yong mga tissue ko mga ilang oras lng sa ER.no need for confinement in my case kaya ng discharge ka agad ako sa hospital..tanong ko lng po..marerefund po ba ng philhealth ko yong mga nagastos ko sa mga laboratories/test sa hospital since im not admitted within 24hrs/days?kasi malaki na po yong nagastos namin for all laboratories test and medicines..marami po salamat. Hi Kris, sorry, Philhealth covers only confinement for at least 24 hours. Others like pneumonia, dapat confined for at least 96 hours. Outpatient tests are not covered. Ask others too. Hi rico, sorry, wala, kasi ang puede lang naman na dependent sa Philhealth is spouse, minor child, at senior or disabled parent. Thanks din. Hi, Just want to ask if possible to use 2 active philhealth members in one patient? Hi Arvin, sorry hindi. One Philhealth membership for one patient. Hi Lyka, yes, go to Philhealth with your ID and 600 pesos. Register then pay for April May June and get your receipt and MDR. That’s good for August. But if you have some more, it’s good din na you pay for July and August, so your coverage is continuous. Pag sa lying-in, magpa-checkup ka don sa pinili mo na lying-in para magamit mo ang Philhealth.